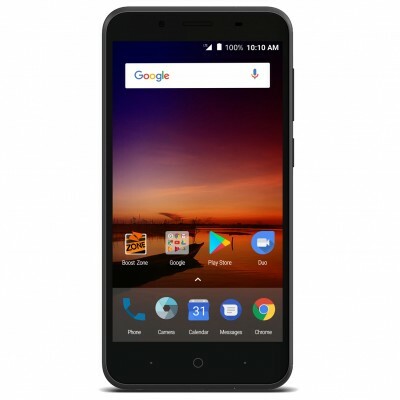 ZTE launched Tempo X budget smartphone for $80 on Boost Mobile , has a a 5-inch 480p display, a 5MP main camera with a secondary 2MP front-facing camera for selfies. It sports a 5-inch screen which has a resolution of 854 x 480 pixels and is offering a 196ppi of pixel density. ZTE Tempo X Boost Mobile is running on the Android 7.1 Nougat operating system out of the box and is powered by a Qualcomm Snapdragon 210 quad-core processor with Adreno 304 graphics and 1GB of RAM and 8GB of internal storage which also has an option to increase memory via microSD card slot. The Tempo X smartphone is equipped with a 2200mAh capacity battery which would give a battery juice for longer hours. it has a 5MP primary camera and has a 2MP front-facing camera and Connectivity options include Bluetooth, 3.5mm audio jack, Wi-Fi, GPS navigation support, Micro-USB port and more. The Boost Mobile network would offer a pretty good variety of affordable smartphones like LG K3 Boost Mobile. This brand introduced a new smartphone which will be available from Boost Mobile network, named as ZTE Tempo X and Sprint carriers would have two operators that support its mobile towers such as Verizon Mobile and Boost Mobile. Switch seamlessly between Sprint’s nationwide 3G and 4G LTE networks, where available. Android 7.1.1 Nougat OS Enjoy longer battery life, easy multitasking, customizable home screens and more personalized settings than ever before. 5-inch (854 x 480 pixel) Touchscreen Display 196ppi of pixel density.